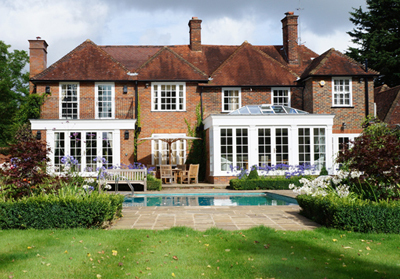 Typically constructed using brick and hardwood, orangeries offer light and airy living spaces that help connect a property’s interior and exterior. Initially fashionable in Britain in the early 1600s, orangeries were originally used by wealthy property owners to cultivate citrus fruits. Today, however, they primarily provide feature rooms with an abundance of natural light, with sitting room, dining room and kitchen orangeries among the most popular projects we work on. One of the key considerations when constructing an orangery is ensuring it has synergy with the property and paying attention to its specific design features; it’s important to try to match them as faithfully as possible in the orangery. Repeating the shape and style of existing windows, ensuring similar period-style features are incorporated into the orangery’s design, and matching the brick or stonework during construction, will all contribute to an orangery that fits seamlessly with the existing house. Great care must also be taken if you own a listed property and you must always seek professional advice for this. There are a number of variables to consider when making any alterations to a listed property. We recommend that you establish at the outset what is and is not possible, which can save time and money. Selecting the right paint colour for the hardwood frame of your orangery will help it blends seamlessly with the rest of your property. We often see orangeries built in the 1950s and 60s that dwarf the house they’re attached to, painted in block colours; an orangery should complement the existing structure. Popular colours from quality paint suppliers such as Farrow & Ball and Zoffany provide well-balanced, tonal shades that work well in harmony with a range of brick and stone finishes. Neutral tones, such as warm creams or greys, often give an elegant, timeless finish, while muted greens, browns and off-whites are also very popular. The key is to find a colour that minimises the impact of the orangery and helps it look as original as possible. 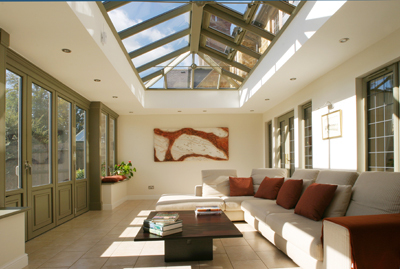 One of the misconceptions we regularly hear is that orangeries are too hot in the summer and cold in the winter. The technology and green features that go into today’s orangeries mean that is no longer the case. Tinted or UV filtered glass and underfloor heating ensure todays wooden orangeries don’t need excessive ventilation and can be comfortably used throughout all four seasons. You can also invest in a fully automated system that automatically opens and closes windows to maintain a set temperature. Contemporary hardwood orangeries are also extremely secure, with hidden multipoint locking system fitted as standard for extra peace of mind. To make the most of an orangery, a south-facing garden is ideal, providing natural light throughout the day. However, the tall windows and roof lanterns of an orangery maximise the amount of light present, helping make it effective living and entertaining space in all conditions. For the interiors, Avoid light-sapping furnishing, such as heavy drapes or blinds, to maximise the light which is available. And choose an appropriate colour scheme; the orangery’s lantern will also provide plenty of natural light. 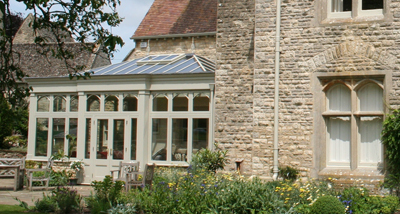 Above all, seek advice and assistance from an experienced professional with expertise in constructing an orangery. Often we see projects where architects’ drawings weren’t right for a particular house or a local joiner lacks the necessary experience for the project. An orangery is a very different structure to a conservatory or extension, and requires the know-how of someone that has experience in their construction and has encountered these sorts of difficulties before.